Task lists and tasks are managed in the Tasks area, and can be used for office communications, reminders, appointment lists, patient lists, daily, weekly, or monthly check off lists, etc. In the Manage Module, click Tasks. The task area may also be docked to the bottom or side of the main Open Dental window. A task list can include nested task lists or tasks. Set permissions for editing and deleting tasks in Security. Tasks lists that have new tasks are flagged with an orange checkbox and the number of new tasks appears in parentheses. When the Tasks area is docked, you can resize the area by dragging the splitter (the horizontal bar between the tasks area and the rest of the screen). To change docking options, right click on the splitter, or click Setup, Task. Options: Set task list options. Show Finished Tasks: If checked, view tasks that have been marked Done in the selected task list. Finished Task Start Date: View tasks marked Done on or after this date. Enter any date in this field. Sort appointment type task lists by AptDateTime: If checked, task lists that have Object Type set as Appointment will sort by the appointment's date and time, not the date and time the task list was created. Default tasks to collapsed state: If checked, tasks that meet the criteria will be collapsed by default. Add Task List: Create a new task list. Add Task: Create a new task. Click the dropdown to add a reminder task. Search: Search for specific tasks. See Task Search. Manage Blocks: Block task popups for specific task lists. Select the lists to block, then click OK. Tasks in selected lists will not pop up, but will still show in the New for User tab until read. Tabs: Click on a tab and its task lists will show. for User: Task lists that the current user is subscribed to. See Subscribe to Task List. Typically includes a user's inbox. New for User: See the current user's new tasks and due reminders all at once. 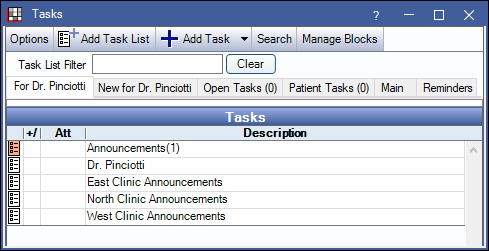 Open Tasks: Keep track of tasks that have an object type of Patient and are From the currently logged on user. This tab is only visible if Show open tasks for user is checked in Tasks Preferences. Patient Tasks: Keep track of tasks that have an object type of Patient and a patient attached. When the attached patient is selected, their tasks will show in this list. Main: All shared task lists and inboxes. Reminders: View all task reminders regardless of due status. Reminders replace repeating tasks in 16.3 and greater. See Task Reminder. In 16.2 and earlier, repeating task tabs show by default. In 16.3 and later, enable or disable repeating task tabs in Task Preferences. Click on a task list to see the tasks within. Edit Properties: Edit task list options. Set Priority: Change the task priority. A task note is added with the user that changed the task and the new task priority (only applies to non-inbox task lists). Cut: Cut task list to move into another list. Paste: Paste a cut task list into another location. Delete: Delete this task list. Subscribe: Subscribe to the task list. Unsubscribe: Unsubscribe to the task list. Note: If you move a main task list into its own sub-task list, the sub-task list(s) will become main task list(s). Double click a task to open it. See Task Window. Done (affects all users): Mark a task as done. Edit Properties: Open task to make edits. Set Priority: Change task priority. Cut: Cut task to move to another list. Copy: Make a copy of the task to move to another list. Paste: Paste a cut or copied task into a list. Send to Me: Send selected task to your inbox. Go To: Go to the patient or appointment associated with the task. Mark as Read: Mark task as read. Task text that is more than 250 characters, has two or more task notes, or one task note more than 250 characters can be expanded or collapsed. The + or - in the +/-column indicates in current state. Click the +/-column header to toggle all tasks between expand or collapse. - indicates a task that is expanded. Click - to collapse text. +indicates a task that is collapsed. Click + to expand. Set the default state in Task Preferences. The task popout window displays the number of tasks in the selected task list. Hover over the Open Dental icon on the taskbar to view. Task count only shows when the tasks window is open and a task list or tab is selected. Why aren't tasks popping up on my screen? Task lists allow for popups. Verify tasks lists selected in Manage Blocks. Your user is assigned to your inbox. You are subscribed to the task list. You are logged in as your own user.